Vinaigrette: Whisk together lemon zest and juice, vinegar, garlic, sugar, honey, oregano and basil. Drizzle in olive oil until combined. Season with salt and black pepper and taste; adjust seasoning if necessary. Whisk in feta cheese. Set aside. 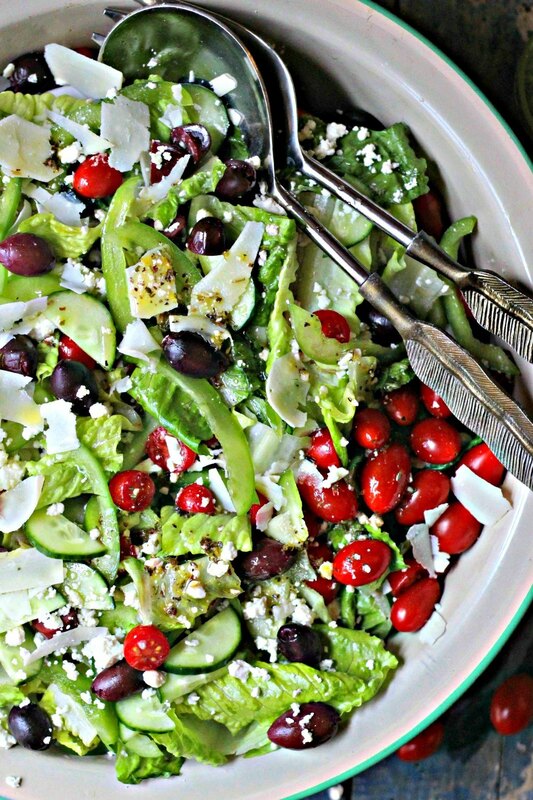 Salad: In a large bowl, combine romaine lettuce, cucumber, bell pepper, tomatoes, olives and feta cheese. Toss with desired amount of dressing. Sprinkle with coarse salt and black pepper and top with Parmesan cheese and garnish with pepperoncini, if desired.